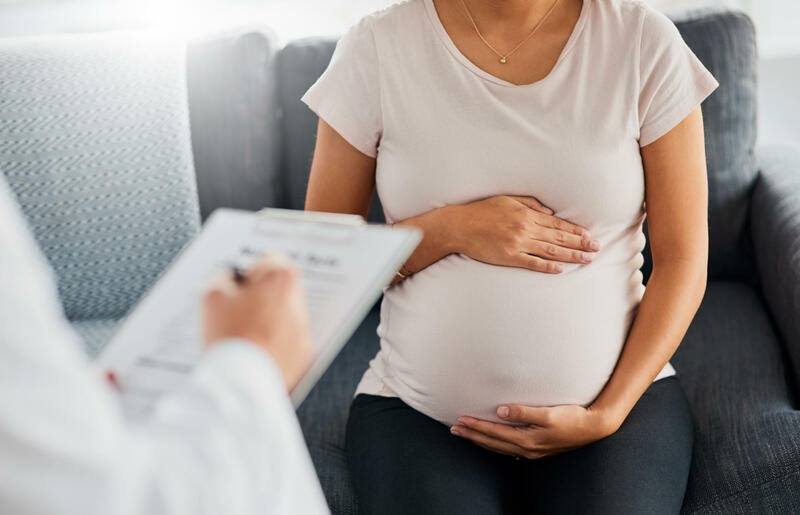 New recommendations from the U.S. Preventive Services Task Force call for doctors to identify patients at risk of depression during pregnancy or after childbirth and refer them to counseling. Doctors can and should do more to prevent depression among pregnant women and new mothers by referring them to counseling. That's the recommendation of the U.S. Preventive Services Task Force, an influential panel of clinicians and researchers that makes recommendations for patient care. "We can prevent this devastating illness and it's about time that we did," says clinical psychologist and researcher Karina Davidson, who is a member of the task force and helped write the recommendations, released Tuesday in JAMA. Depression during pregnancy and in the year after childbirth is surprisingly common. It's estimated that 1 in 7 pregnant women will suffer depression while pregnant or following childbirth. The consequences of maternal depression can be severe, according to Davidson, who describes a "cascading set of problems" including premature birth, low birth weight and failure to thrive. After childbirth, new mothers who are depressed can be neglectful and inattentive to their newborn, putting the infants at risk for an even greater number of problems. In 2016, the Task Force recommended screening for depression among all adults, including pregnant women, and if depressive symptoms are detected, that adults, including pregnant women be treated. This year, the Task Force has taken their recommendation further, focusing on perinatal depression — depression before, during and after pregnancy — and recommending evidence-based interventions aimed at preventing it in the first place. "We actually have evidence now that if you find women who are not currently depressed but who are at risk for becoming depressed during pregnancy or within a year after childbirth behavioral counseling can help them prevent getting this disease," says Davidson. The Task Force reviewed 50 studies which examined a variety of different treatments including counselling, physical activity, education, and medication such as antidepressants and omega-3 fatty acids. They determined there was convincing evidence that counseling interventions such as cognitive behavioral therapy and interpersonal therapy were effective in preventing perinatal depression. In fact, both types of therapy reduced the risk of depression by 39 percent. "This is a very big deal," says Davidson. In both approaches, at risk women received five to eight group therapy sessions during pregnancy, followed by one to five sessions following delivery of their baby. Interpersonal therapy focuses on shifting roles and responsibilities after having a child and how to communicate or deal with those changes and stressors. For example, Davidson says new parents often have trouble delegating who's going to get up in the middle of the night or who's going to care for a baby who hasn't settled down in 15 or 20 minutes. The therapy essentially functions as a "rehearsal," she says, for new mothers to actually practice what to say and how to handle a stressful situation in order to minimize conflict. Cognitive behavioral therapy focuses more on individual thoughts, feelings and behaviors and is equally effective in preventing depression, says Davidson. While Davidson says more research is needed to develop a checklist for doctors and healthcare providers to accurately screen pregnant women for depression, there are some known factors that put women at greater risk. This includes a previous history of depression or depressive symptoms, a family history of depression or social stresses like teen or unwanted pregnancy, low income, unemployment and partner violence. "There are a host of problems that predispose women to depression," she says. Davidson says the new recommendations dovetail well with the 2016 recommendations. If primary care doctors, obstetricians or nurse practitioners screen pregnant patients for depression and find they are at risk, they can then determine if they have the training to provide counselling themselves or, they can refer them to providers who offer this type of behavioral counselling. In an editorial accompanying the recommendations, Harvard Medical School psychiatrist Marlene P. Freeman writes that the delivery of effective care for at risk pregnant women will require creative solutions. It's a "daunting task", she says, particularly since as it is now, the U.S. is not adequately serving women currently suffering mental health issues during pregnancy. Many women face numerous barriers to effective treatment including socio-economic status, health insurance status and geography. As a result, Freeman notes that for many women, receiving effective recommended treatment will be difficult, hinging on whether clinicians who provide obstetrical care have the time or expertise to perform psychological assessments and tailor referrals, whether women actually engage in treatment and whether there is some sort of follow up to determine if treatment worked. Freeman says that since there is no standard screening tool for doctors to use as a checklist for perinatal depression, it can be a "complex task" for the average healthcare provider to determine whether a woman is indeed at risk. Future research, she says, could develop easy-to-use screening tools to make it more likely for providers to discern who should be referred for preventive treatment. That research could include the discovery of biomarkers that indicate stress, inflammation or genetic variables that suggest vulnerability. Freeman adds that the new recommendations to screen and refer women for counselling hold promise to improve many lives since an estimated 400,000 women in the U.S. have perinatal depression. Effective prevention of perinatal depression, says Freeman could lead to a "trajectory of better outcomes for a lifetime for both mother and child." Counseling during pregnancy and after childbirth can help prevent depression among women who are susceptible to it. That finding comes from new research by federal health officials. NPR's Patti Neighmond has more on the recommendations from the U.S. Preventive Services Task Force. PATTI NEIGHMOND, BYLINE: It's estimated that 1 in 7 pregnant women will suffer depression while pregnant or in the year after childbirth. The consequences, says task force member psychologist Karina Davidson, can be devastating. KARINA DAVIDSON: Babies are born with low birth weight. They're born prematurely. NEIGHMOND: And during their first year of life, babies often don't get the positive feedback they need to thrive. In fact, the feedback from mom is often negative. DAVIDSON: Neglect, inattention to problems or symptoms that the baby is having. NEIGHMOND: The new guidelines suggest health care providers assess a woman's vulnerability to depression - for example, whether she suffered depression in the past, if she has a family history of the disease or if she's experiencing other stressful situations. DAVIDSON: Teen pregnancy, being unemployed, recent exposure to intimate partner violence. NEIGHMOND: Davidson says all these can increase the risk of depression during and after pregnancy. The task force wanted to figure out what could help prevent that. They analyzed 50 studies which looked at interventions like physical activity, education, medication and counseling. They found substantial evidence that cognitive behavioral therapy and interpersonal therapy worked. Both therapies decreased the risk of depression by 39 percent. CBT focuses on changing an individual's perception and behavior. Interpersonal therapy helps women cope with changes in their relationships. DAVIDSON: So for example, new parents often have trouble delegating who's going to get up in the middle of the night or who's going to come in after 20 minutes of a baby not settling. NEIGHMOND: Women role-play, sort of rehearse what they'll say and how they'll communicate. Both therapies involved five to eight group sessions during pregnancy and then one to two sessions after childbirth. The task force recommends clinicians assess a patient's risk for depression and then refer them for appropriate counseling. Easier said than done, says an editorial accompanying the new guidelines. It points out that many women don't have access to mental health services, don't have adequate insurance or live in rural areas where interventions like this just aren't available. Patti Neighmond, NPR News. Transcript provided by NPR, Copyright NPR.